Jean-Baptiste Pierre Antoine de Monet, Chevalier de Lamarck (August 1, 1744 – December 28, 1829) was a French naturalist and an early proponent of the idea that evolution (descent with modification) occurred and proceeded in accordance with natural laws. Lamarck, however, is remembered today mainly in connection with his now superseded theory of heredity, the "inheritance of acquired traits" (see Lamarckism). 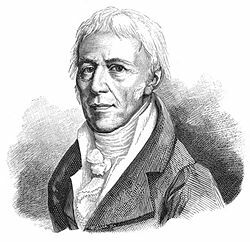 Lamarck was also one of the first to use the term biology in its modern sense, and he coined the term invertebrates. Lamarck was born in Bazentin-le-Petit, Picardie into an impoverished family (hence the title of chevalier, knight). Lamarck served in the army before becoming interested in natural history and writing a multi-volume flora of France. This caught the attention of Georges-Louis Leclerc, Comte de Buffon who arranged for him to be appointed to the Muséum National d'Histoire Naturelle in Paris, France. After years working on plants, Lamarck was appointed curator of invertebrates. He also began a series of public lectures. Lamarck saw spontaneous generation as being ongoing, with the simple organisms thus created being transmuted over time (by his mechanism) becoming more complex and closer to some notional idea of perfection. He thus believed in a teleological (goal-oriented) process where organisms became more perfect as they evolved. During his lifetime, Lamarck became controversial; his criticism of the paleontologist Georges Cuvier’s anti-evolutionary stance won him no friends. Lamarck married three, possibly four, times. His first marriage was to his mistress from 1777, Marie Delaporte, the mother of his first six children, whom he married on her deathbed in 1792. He remarried in 1795 to Charlotte, but she died in 1797. Lamarck married his third wife, Julie Mallet, in 1798. She died in 1819. Rumors exist of a fourth wife and widow but no documentary evidence exists of her. Lamarck died penniless in Paris on December 28, 1829. Lamarckism or Lamarckian evolution is a theory put forward by Lamarck based on the heritability of acquired characteristics, the once widely accepted idea that an organism can pass on characteristics that it acquired during its lifetime to its offspring. Lamarck proposed that individual efforts during the lifetime of the organisms were the main mechanism driving species to adaptation, as they supposedly would acquire adaptive changes and pass them on to offspring. While enormously popular during the early nineteenth century as an explanation for the complexity observed in living systems, after publication of Charles Darwin's theory of natural selection, the importance of individual efforts in the generation of adaptation was considerably diminished. Later, Mendelian genetics supplanted the notion of inheritance of acquired traits, eventually leading to the development of the modern evolutionary synthesis, and the general abandonment of the Lamarckian theory of evolution in biology. Between 1794 and 1796 Erasmus Darwin wrote Zoönomia suggesting "that all warm-blooded animals have arisen from one living filament," and "with the power of acquiring new parts" in response to stimuli, with each round of "improvements" being inherited by successive generations. Subsequently Lamarck proposed in his Philosophie Zoologique of 1809 the theory that characteristics that were "needed" were acquired (or diminished) during the lifetime of an organism were then passed on to the offspring. He saw this resulting in the development of species in a progressive chain of development towards higher forms. Law of use and disuse. In every animal which has not passed the limit of its development, a more frequent and continuous use of any organ gradually strengthens, develops and enlarges that organ, and gives it a power proportional to the length of time it has been so used; while the permanent disuse of any organ imperceptibly weakens and deteriorates it, and progressively diminishes its functional capacity, until it finally disappears. Inheritance of acquired traits. All the acquisitions or losses wrought by nature on individuals, through the influence of the environment in which their race has long been placed, and hence through the influence of the predominant use or permanent disuse of any organ; all these are preserved by reproduction to the new individuals which arise, provided that the acquired modifications are common to both sexes, or at least to the individuals which produce the young. In essence, a change in the environment brings about change in "needs" (besoins), resulting in change in behavior, bringing change in organ usage and development, bringing change in form over time—and thus the gradual transmutation of the species. While such a theory might explain the observed diversity of species and the first law is generally true, the main argument against Lamarckism is that experiments simply do not support the second law—purely "acquired traits" do not appear in any meaningful sense to be inherited. For example, a human child must learn how to catch a ball even though his or her parents learned the same feat when they were children. The argument that instinct in animals is evidence for hereditary knowledge is generally regarded within science as false. Such behaviors are more probably passed on through a mechanism called the Baldwin effect. 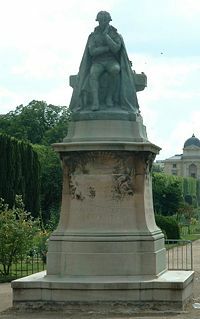 Lamarck’s theories gained initial acceptance because the mechanisms of Mendelian inheritance were not elucidated until later in the nineteenth Century, after Lamarck's death. A form of Lamarckism was revived in the Soviet Union of the 1930s when Trofim Lysenko promoted Lysenkoism, which suited the ideological opposition of Joseph Stalin to genetics. This unscientific agricultural policy was later blamed for crop failures and famine. Neo-Lamarckism is a theory of inheritance based on a modification and extension of Lamarckism, essentially maintaining the principle that genetic changes can be influenced and directed by environmental factors. While there is not evidence for Lamarckism with respect to higher organisms—that is, there is no evidence that acquired changes are genetically transmitted—some scientists argue that it can be observed among microorganisms, with induced changes inherited among bacteria and protozoans (Cairns 1998). In 1988, John Cairns, Julie Overbaugh, and Stefan Miller suggested in a publication in Nature that some E. coli mutations could develop in a Lamarckian manner (Cairns et al. 1988). The group took a mutated strain of E. coli that was unable to consume the sugar lactose and placed it in an environment where lactose was the only food source. They observed over time that mutations occurred within the colony at a rate that suggested the bacteria were overcoming their handicap by altering their own genes. Cairns, among others, dubbed the process adaptive mutagenesis. If bacteria that had overcome their own inability to consume lactose passed on this "learned" trait to future generations, it could be argued as a form of Lamarckism; though Cairns later chose to distance himself from such a position. More typically, it might be viewed as a form of ontogenic evolution. Jean Molino (2000) has proposed that Lamarckian evolution may be accurately applied to cultural evolution. This was also previously suggested by Peter Medawar (1959) and Conrad Waddington (1961). Likewise, religions generally adhere to the view of the inheritance of acquired spiritual traits. That is, there is a view that actions in one's life affect one's spirit and that such passes down to one's lineage in the form of spiritual merit or demerit. This is the view that the "sins of the fathers, when they have not been properly expiated, are passed on and lead to evil consequences for subsequent generation" (Wilson 1991). The doctrine of karma, common to many Eastern religions, as well as the inheritance of sin in some Western religions, reflect this viewpoint. Examples are found in the Bible (Exodus 20:5-6, "For I the Lord your God am a jealous God, visiting the iniquity of the fathers upon the children to the third and fourth generation"), the Talmud of Judaism (Yoma 87a, "Not alone that they render themselves guilty but they bestow guilt upon their children and children's children until the end of all generation. Many sons did Cannan have, who were worthy to be ordained like Tabi, ... but the guilt of their ancestor caused them to lose their chance"), the Taoist Treatise on Response and Retribution (4-5, "If any guilt remains unpunished at death, the judgement extends to the individuals posterity"), the Hindu Laws of Manu (4.173, "if the punishment falls not on the offender himself, it falls on his sons; if not on the sons, at least on his grandsons"), among other sacred scripture. The concept of original sin is also based on this understanding, for all humanity inherited the spiritual mistake of the original ancestors. Removal of the disharmony caused in the universe through wrong actions, or the paying of karmic debt, requires restitution for the past actions, such as reflected in the Buddhist Diamond Sutra (16, "By virtue of their present misfortunes, the reacting effects of their past will be thereby worked out"). This can be seen as being paid by future generations who have inherited the repercussions of the wrong actions. Several historians have argued that Lamarck's name is linked somewhat unfairly to the theory that has come to bear his name, and that Lamarck deserves credit for being an influential early proponent of the concept of biological evolution, far more than for the mechanism of evolution, in which he simply followed the accepted wisdom of his time. Lamarck believed in organic evolution at a time when there was no theoretical framework to explain evolution. He also argued that function precedes form, an issue of some contention among evolutionary theorists at the time. Lamarck died 30 years before the first publication of Charles Darwin's Origin of Species. As science historian, evolutionist, and paleontologist Stephen Jay Gould has noted, if Lamarck had been aware of Darwin's proposed mechanism of natural selection, there is no reason to assume he would not have accepted it as a more likely alternative to his "own" mechanism. It is also notable that Darwin, like Lamarck, lacked a plausible alternative mechanism of inheritance—the particulate nature of inheritance was only to be observed by Gregor Mendel somewhat later, published in 1866. Its importance, although Darwin cited Mendel's paper, was not recognized until the modern evolutionary synthesis in the early 1900s. An important point in Lamarck's favor at the time was that his theory contained a mechanism describing how variation is maintained, which Darwin’s own theory lacked. Furthermore, while Darwin proposed natural selection as the main mechanism for development of species, in the Origin of Species Darwin did not rule out a variant of Lamarckism as a supplementary mechanism. Indeed, Darwin not only praised Lamarck in the third edition of The Origin of Species for supporting the concept of evolution and bringing it to the attention of others, but also accepted the idea of use and disuse, and developed his theory of pangenesis partially to explain its apparent occurrence. Darwin and many contemporaries also believed in the inheritance of acquired characteristics, an idea that was much more plausible before the discovery of the cellular mechanisms for genetic transmission. Epigenetic inheritance is thought to be Lamarckian, by some, but this is not widely accepted by evolutionary biologists. Epigenetics itself is the study of various gene functions arising from the same gene in different environments. The same gene is passed on to offspring, and the environment determines its expression, so this process still fails to be Lamarckian. The memetic theory of cultural evolution could be considered a form of Lamarckian inheritance of non-genetic traits. However, this is a point against memetics as a true parallel to genetics, not a point for Lamarckian inheritance. 1809. Philosophie zoologique, ou Exposition des considérations relatives à l’histoire naturelle des animaux..., Paris. 1801. Système des animaux sans vertèbres, ou tableau général des classes, des ordres et des genres de ces animaux; présentant leurs caractères essentiels et leur distribution, d'après la considération de leurs..., Paris. 1815-1822. Histoire naturelle des animaux sans vertèbres, présentant les caractères généraux et particuliers de ces animaux..., Tome 1 (1815); Tome 2 (1816); Tome 3 (1816); Tome 4 (1817); Tome 5 (1818); Tome 6, Pt.1 (1819); Tome 6, Pt.2 (1822); Tome 7 (1822). Cairns, J. 1998. Mutation and cancer: the antecedents to our studies of adaptive mutation. Genetics 149: 1433-1440. Hall, B. G. 1988 Adaptive evolution that requires multiple spontaneous mutations. I. Mutations involving an insertion sequence Genetics 120: 887-897. Molino, J. 2000. Toward an evolutionary theory of music and language. In S. Brown, N. L. Wallin, and B. Merker. 2000. The Origins of Music. Cambridge, Mass: MIT. ISBN 0262232065. Vetsigian K, C. Woese, and N. Goldenfeld. 2006. Collective evolution and the genetic code. PNAS 103: 10696-10701. Waddington, C. 1961. The human evolutionary system. In M. Banton, ed., Darwinism and the Study of Society. London: Tavistock.